The TV series was based loosely on the Hill Ranch, which was located at the western edge of Calaveras County, not far from Stockton. The TV series was based loosely on the Hill Ranch located at the western edge of Calaveras County, not far from Stockton. One episode placed the Barkley Ranch a few hours’ ride from town while another has Jarrod riding past a Calaveras County sign on his way to the TV series’ ranch. The Hill Ranch existed from 1855 until 1931, exceeded 1,000 acres (4.0 km2), and had the Mokelumne Riverrunning through it. Lawson Hill ran the ranch until he was murdered in 1861. His wife Euphemia (aka “Auntie Hill”) then became the matriarch. During their marriage they had four children, one daughter and three sons. Today, the location of the ranch is covered by the waters of Lake Camanche. A California state historical marker standing at Camanche South Shore Park mentions the historic ranch. The set used to film the exterior of the Barkley Mansion stood on the back-lot of Republic Studios from 1947 until 1975. In the first episode, “Palms of Glory,” the grave of Thomas Barkley (1813–1870) is shown after it is commented that he fought the railroad six years ago establishing that the show was initially set no later than 1876. Sierra Railway Engine #3 at the old Jamestown, California Depot, for the filming of the pilot episode of The Big Valley, 1964. In “The Odyssey of Jubal Tanner”, Jubal states to Victoria Barkley that he’s been gone 30 years since his wife Margaret Tanner’s death, her grave showing her passing away in 1854; this appears to indicate that the series starts in 1884. However, in another episode, a newly dug grave has a marker with the year 1878, so the best can be said is that the events of the series take place sometime in the late 1870s or early 1880s. Victoria Barkley, portrayed by Barbara Stanwyck, was the widow of Thomas Barkley. She was the head of the wealthy, influential Barkley family who lived in 19th century Stockton in California’s Central Valley. She was the main character of the series. Victoria Barkley was the owner and head of the Barkley ranch. In fact, Stanwyck’s refusal to portray Barkley as fragile was controversial at the time. Barkley’s husband had been killed six years prior to the beginning of the series. Victoria Barkley loved and was proud of all her children, including her late husband’s illegitimate son, Heath, whom she would refer to as “my son.” Stanwyck, who was able to go effortlessly and convincingly from the refined, elegant lady of the manor to a jean clad cowgirl as tough as any cowboy, appeared in the most episodes for a total of 103 of the 112 episodes. Her episodes were often surprisingly hard hitting, seeing her character either locked away in a lunatic asylum to prevent her testifying as eyewitness at a murder trial (“Down Shadow Street”), or taken prisoner in a prison wagon to replace a dead female convict (“Four Days to Furnace Hill”), or trapped underground following a cave-in (“Earthquake”). Stanwyck always took her featured lead roles with all the confidence of a Hollywood legend, being both credibly warm and tough where the scripts required. Jarrod Thomas Barkley, the eldest son, was a respected attorney. Richard Long played the role of the educated, refined and calmer of the Barkley sons who handled all of the family’s legal and business affairs. While Jarrod preferred the law to settle disputes, he was known to resort to frontier justice and violence when necessary. He was briefly married in one episode (“Days of Wrath”) only to see his new wife murdered, with a bullet intended for him. It was a memorable episode in which an enraged Jarrod loses all his calm genteel mannerisms, then relentlessly tracks down the killer. He’s in the midst of killing him with his bare hands, before he’s stopped by Nick and Heath. Long appeared in 96 of the 112 episodes. Nicholas “Nick” Jonathan Barkley, the hot-tempered brawling younger son who managed the family ranch, was portrayed by Peter Breck. Well known for his black leather vests, large black hat and black leather gloves, as well as his loud and brawling demeanor, he was notorious for getting into fist fights. At times, he would fight with his brothers as well, though underneath the gruff surface he was warm and caring, had a fun-loving carefree side, a great sense of humor, and loved his family deeply. Breck appeared in 101 of the 112 episodes. 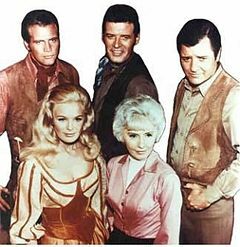 Audra Barkley, played by Linda Evans, was Victoria’s only daughter. Audra was somewhat self-absorbed, bold, and forward. Far from demure, she performed daring stunts and rode astride, like her brothers. Audra, like Nick and Eugene, was initially leery of Heath’s story that he was her father’s son. Early on, she unsuccessfully attempted to seduce Heath, so as to expose him as a fraud. Later however, Audra and Heath became very close as a real brother-and-sister bond developed between them. She also had a caring side, displayed by tending to children from the local orphanage. A few episodes dealt with her romances, one notable episode being “My Son My Son” in which Robert Walker Jr. guests as a suitor who proves to be mentally unstable. During the show’s final two seasons, Evans’ appearances were reduced because she wanted to spend more time with her husband John Derek. Heath Barkley was the illegitimate son of Victoria’s late husband, and he literally had to fight his way into the Barkley home. 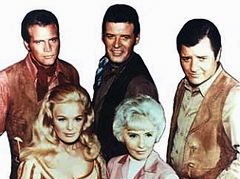 Lee Majors portrayed even-tempered but rough and tumble Heath, who was often angry and aggressive throughout the early episodes due to his belief that Tom Barkley had abandoned his real mother after she became pregnant. In truth, Tom Barkley never knew about Heath, as Heath’s mother had never told him, and never even told Heath until she was on her deathbed. Heath gradually gained acceptance from the rest of the Barkley clan as the first season progressed until he became as much a “Barkley” as the rest of the family, and his love for them became equal. Heath would come to call Victoria “Mother” when speaking to her directly and about her with his siblings. Although Nick was initially leery of Heath and felt he had to test Heath’s mettle, Heath would go on to prove himself worthy of even Nick’s acceptance, and eventually Nick seemed to grow even closer to Heath than he was to Jarrod, perhaps in a sense due to Heath having more in common with him than Jarrod did. Audra became closer to Heath than either of her other brothers. Majors, who is initially very blond-haired but gradually gets darker haired as the show continues, appeared in 95 of the 112 episodes. The youngest Barkley son was Eugene, a medical student studying at Berkeley, played by Charles Briles. Like his older brothers he was known to have a temper as seen in the Season 1 episode “Boots with My Father’s Name”. He was seen sporadically in only eight first season episodes and then written out. Only once was his name ever mentioned again. In 1965 Briles was drafted by the United States Army, but was given a deferment long enough for him to complete filming the first season. Briles’ unit did all their training in California and he was never shipped to Vietnam. By the time he got out of the army, however, the series had been cancelled. The regular cast was rounded out by Napoleon Whiting, as Silas, the Barkleys’ majordomo.